Being social led me to have kale twice within five days, and, I liked it! So, obviously, it led to searching for a recipe that seemed appealing enough to try at home as I wanted to realistically incorporate it into my life. In addition to kale I wanted a recipe that included quinoa in order to ensure a super charged meal. This craving led me to a recipe for a Kale, Quinoa, Red Pepper and Avocado Salad with Lemon Dijon Vinaigrette, which I proceeded to enhance by adding roasted shrimp! Being that I had never cooked quinoa, roasted shrimp, nor had I steamed kale before I was a bit nervous to embark in this experiment. My sister, whom is my roommate, told me not to count her in for the meal but that she would have a taste. However, I recognized the greatness in the flavors called for in the recipe and simply knew that, should I properly cook the before mentioned ingredients, it would be a successfully scrumptious meal. So give it a try! Whether for a pot-luck, hosting friends, or simply feeding yourself and yours' this makes for a refreshing and delicious, not to mention healthy, choice! The recipe yields one large salad and serves four large plates making for a complete meal ready to serve in 40 min! Bring 1 ⅓ cup water to a boil in a saucepan. Add the quinoa to boiling water with a dash of salt and sprinkle of olive oil and whisk for 1 minute (this prevents clumping). Reduce heat to medium-low, cover, and simmer until the quinoa is tender, and the water has been absorbed, about 14 to 16 minutes. Set aside to cool. Place kale in a steamer basket over 1 inch of boiling water in a saucepan. Cover saucepan with a lid and steam kale until hot, about 45 seconds; transfer to a large plate. 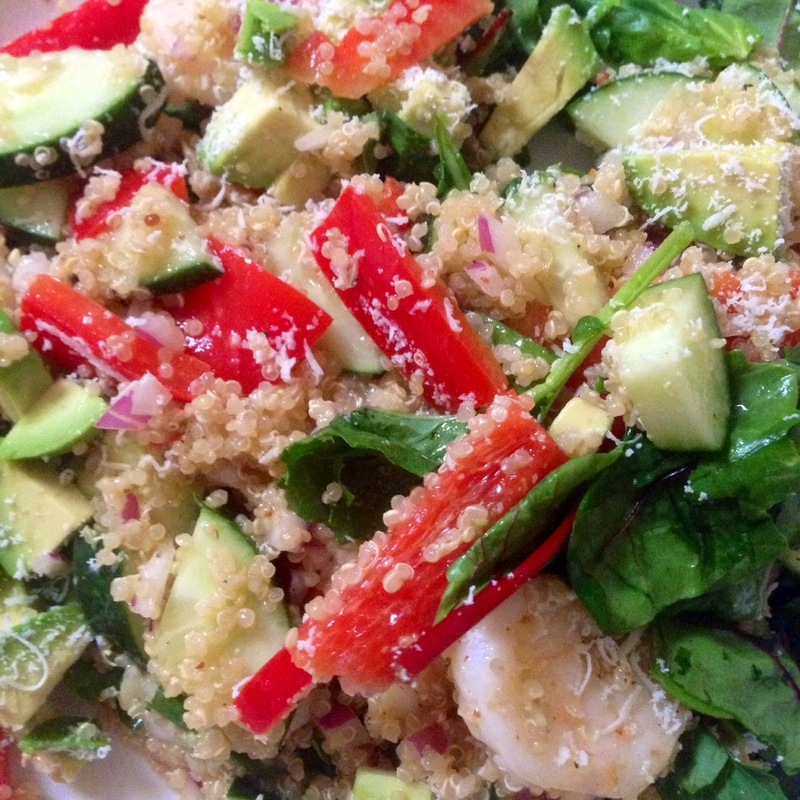 Top kale with shrimp, quinoa, avocado, cucumber, bell pepper, red onion, and feta cheese. Whisk olive oil, lemon juice, Dijon mustard, sea salt, and black pepper together in a bowl until the oil emulsifies into the dressing; pour over the salad. Credit where credit is due: Salad based on Kale, Quinoa, and Avocado with lemon dijon vinaigrette salad from AllRecipes & Roasted shrimp learned from Ina Garten's Roasted Shrimp Cocktail published on FoodNetwork!